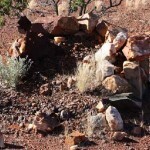 Follow the gold prospecting adventures of Jack and Jill in Western Australia. Having just returned to Victoria after 11 weeks prospecting in Western Australia, we have cleaned, weighed, counted and admired our golden finds. There was not one piece that would make any national news broadcast, the largest being just over 6 grams, but imagine the fun of un-earthing nearly 1000 small nuggets? 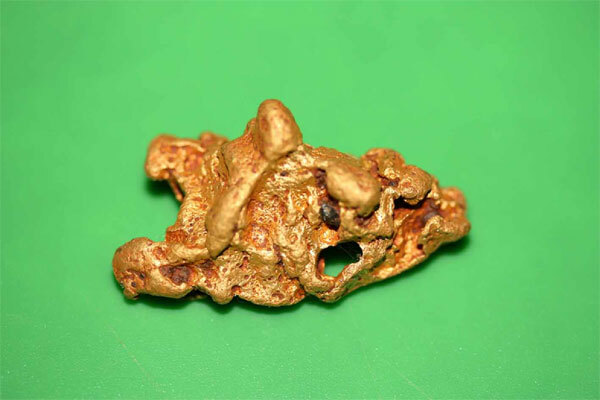 We were shown a specimen weighing 8 oz and a 25 gram nugget found on the goldfields we were detecting, and stories of other larger pieces circulated via the prospecting grapevine, confirming our belief that good nuggets were still out there to be found. Although our Minelab GPX 5000’s proved capable of locating the better-sized nuggets on the last 2 WA trips, we just didn’t walk over any notable ones this year. One thing that I almost did walk over was a small snake who believed that Spring had arrived on a 16C day in July. I had found a couple of nuggets quite close and resented having to leave that patch of sunlight to him. We had planned and gained permission to move around a number of mining areas throughout the goldfields, but after only minimal success at the first three, we were fortunate to find an area that was producing much better returns each day, and spent the last six weeks of our time without moving again. For those who are wondering about equipment, we went armed with 12”x 7” elliptical, 12” round and 16” round Nugget Finder coils and Rooster Booster-speaker combinations. It was interesting to reflect as we looked back through our records, that there was not one full day’s detecting for either of us when we did not find a least one piece each (even if it was only .1 or .2 of a gram), with our best day producing 38 nuggets between us, giving a grand total of just over 11 ounces for the trip. Jack and Jill’s most northerly prospecting spot gave only mild success over quite a few days, with only one area that had been previously scraped to remove the surface stones, providing a number of small nuggets. On the last day before moving, and looking for greener fields, Jack decided to try again on a bulldozed area, which had almost all the soil removed, right down to bedrock. Beside the dozed section, he heard a very faint sound, (probably just ground noise) and investigated, just in case it was a metallic signal. After removing 30 cms of soil, he reached rock, and, by this time, the signal had become quite definite. As rock does not produce rubbish, it was time for some hard work with the hammer and chisels, and after digging 15 cms deeper; he uncovered a nice specimen in quartz, containing about 27 grams of gold. As it is almost time to return to Victoria, we will conclude with a snippet from another location further to the west, which has reminded us not to be discouraged by the evidence of others having detected an area before us. We had never visited this particular goldfield before, and spent some time driving around, looking for likely auriferous ground. However, there were a number of prospectors in the area, and every hill and gully appeared to have a vehicle parked on it. Jill spotted some scrapings which appealed to her, but a prospector was right in the middle of the area. Returning a few days later, it was surprising to find there were virtually no new holes dug, but perhaps there was no gold left anyway, we thought! Within a few minutes Jill had 4 pieces, and Jack soon followed with a 3 gram nugget. 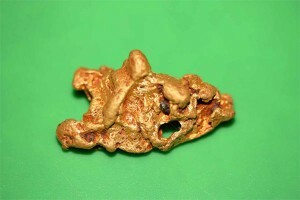 Thankfully, the previous prospector will never lose any sleep over missing 17 yellow treasures, weighing a total of 15 grams. “Those look like detector holes”, Jill said, pointing to the right-hand side of the track, as we drove along. The terrain was flat, and quite uninteresting, but, sure enough, someone had obviously found some gold in the previous few weeks. It was 4.30 in the afternoon, but we decided to stop for a short time, and see if any nuggets had been missed. Jack picked up a couple of small pieces, and Jill decided to try the left-hand side of the track, where there was no sign of recent activity, and retrieved a couple of pieces in a few minutes. We had heard that a couple in another prospecting group were working on a patch in the area, but these holes were made prior to the last rain. Returning the next morning we saw their vehicle 100 metres further over on the RH side!!! Not wanting to intrude, even at a distance, we kept driving. A few days later, having heard that the group had moved on to another mining centre, we went back to see how far they had extended their patch, but there were no holes on the LH side. 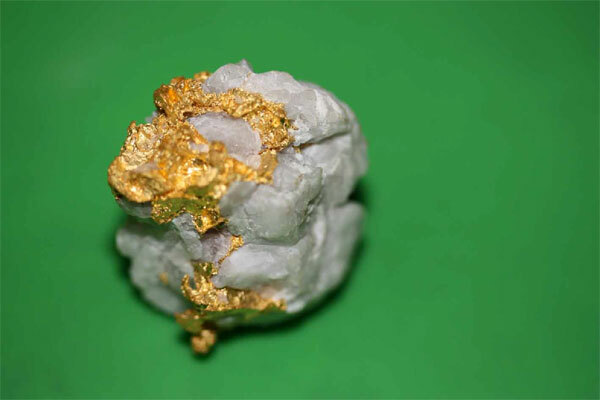 Over the next two days, 137 small nuggets were added to our gold tally by slow, careful detecting, plus 31 that had been missed by the other group in their area. Having exhausted that patch, and not coming across anything else significant, it was time to look further afield. Moving north, we set up camp in an area that had proved fruitful on a couple of previous trips, but it had become very well known, and heavily worked. Jill was becoming a bit discouraged, as neither of us could get even .1 of a gram in spots that had previously been quite productive. How exciting, then, to see Jack wielding his pick with force into a deep hole! On joining him, the prediction was – “being on the side of a creek, it’s probably junk!” However, a few inches further down, his hard work was rewarded with a very attractive 43 gram nugget. Hello again from Jack and Jill in WA. As we look back through the diary it is great to be able to assure you that, no matter how many prospectors come and go around the old mining centres, no one gets all the gold! When we last wrote, we had just set up our first camp, and spent a few hours swinging the detectors. Jill was still to unearth her first nugget. 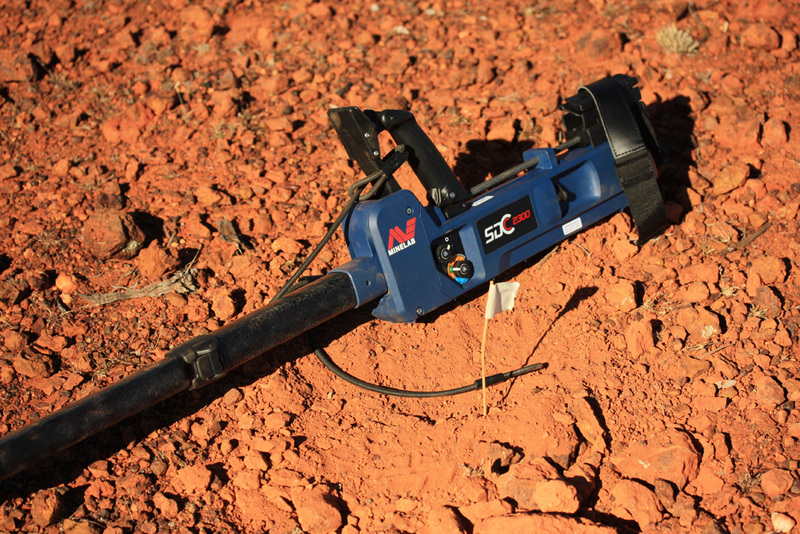 This was not the first visit to this site, and we were quite surprised how many more small nuggets could be retrieved now with the latest Minelab GPX 5000 metal detectors. Over the years we have traded up each time a new machine was released. We have never been disappointed in the upgrade and have always been able to find enough gold to cover the changeover cost. However, we know that not everyone has the same experience – there are so many factors influencing success – learning to master your detector, the amount of time you spend on the goldfields, using an appropriate coil for the situation, recognizing potential auriferous ground, and an element of sheer good luck! For us, each day produced something yellow, with the best daily tally being 25 “sub grammers” and a 6 gram nugget for Jill being the best find for that location. Incidentally, our friend camping in the same area dug down 35 cm for a half ounce piece we had missed amongst some of the small bits. Adding to the enjoyment of our winter excursions has always been the outback scenery, and, at the second camping place, we decided to visit an advertised nature reserve, boasting outback accommodation in an old shed. However a severely eroded creek crossing presented a challenge Jack was not prepared to risk, even in a 4 wheel drive vehicle. “Plan B” soon presented itself as we explored various tracks, and came across a couple of old mineshafts and the remnants of an early miner’s camp, consisting of a fireplace and the usual paraphernalia left lying around. 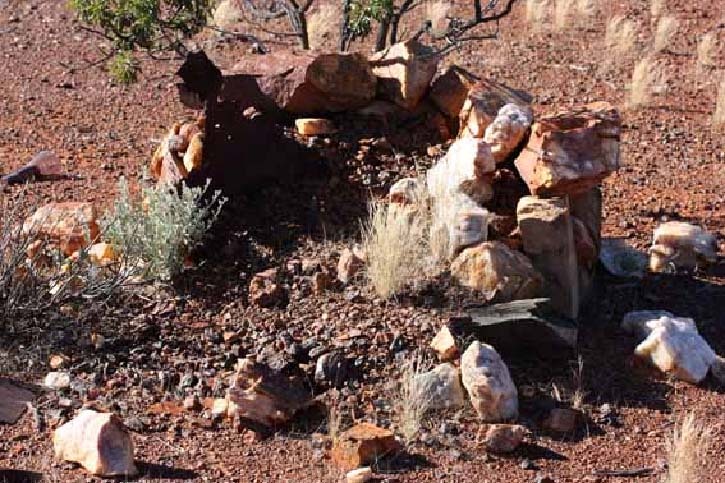 The surrounding area, with its gentle slopes, liberally scattered with quartz and ironstone rocks, looked likely ground for alluvial nuggets, and we decided to “swing the coil” for an hour before returning to the caravan. Except for the deep shafts, there was no evidence of gold having been found on these hills, so we were quite excited when Jill snagged a .2 gram piece in the first 10 minutes. Although small and insignificant, it fuelled our enthusiasm, and Jack headed for the nearby creek and was soon rewarded with a number of nuggets in and around the gutter, including a 1 gram piece sitting exposed on a rock bar in the middle of the dry creek bed. Jill continued to work across the slope, regularly turning up small nuggets. The best find for the day weighed 4 grams. This was indeed a memorable occasion! 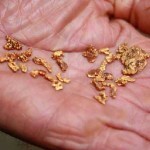 Have you ever considered a gold prospecting trip to outback Western Australia? Not sure what to expect? Where to go? What to take? Is there any gold still to be found? We have been asked to share our diary of day to day life on the goldfields over this winter. We plan to remain anonymous, and have chosen the “nom de plumes” Jack and Jill. This seems appropriate as we have “climbed up the hill” many times each week in search of any remaining nuggets scattered amongst the ironstone and quartz rocks which typify the WA goldfields. Now, to go back to the start of this adventure! With caravan and 4 wheel drive loaded, and high expectations, we crossed the border into South Australia and camped at a roadside stop for the first night. For Jill, much of the first day was spent mentally confirming that nothing necessary was left behind. Yes, Miners’ Rights, maps, medication, water containers, detector spares, tools, tyre repair kit, and various replacement parts for the vehicle, were all present. Jack’s thoughts were centred around the comparative cost of diesel this year, and which days we would have a tail wind, to reduce fuel consumption. Generally speaking, the increase proved to be only marginal. The top price we paid was $1.94 at Belladonia. Due to the abundance of wild life – kangaroos, wombats, emus, and camels, we chose to drive only in daylight hours, and by the third night, were almost to the WA border. As usual, fruit and vegetables, honey, nuts, polystyrene boxes and seeds could not be taken into WA, and this year, car mats were inspected for grass seeds, as well! The fourth night’s roadside camp was between Norseman and Kalgoorlie, and by the fifth night we were on the goldfields, a few hundred kilometres north of Kalgoorlie. One of the first things we noticed was that not all of WA’s wildflowers wait for spring – some were already flowering in May. The only minor hiccup for the trip was Jack leaving the water buckets at a service station in Kalgoorlie after removing them from the van boot, to use the hose and replenish the water supply. This would not have been worthy of note, except that the outback town en route had neither buckets, nor replacement cassette toilet chemicals, which had been stored in the buckets. 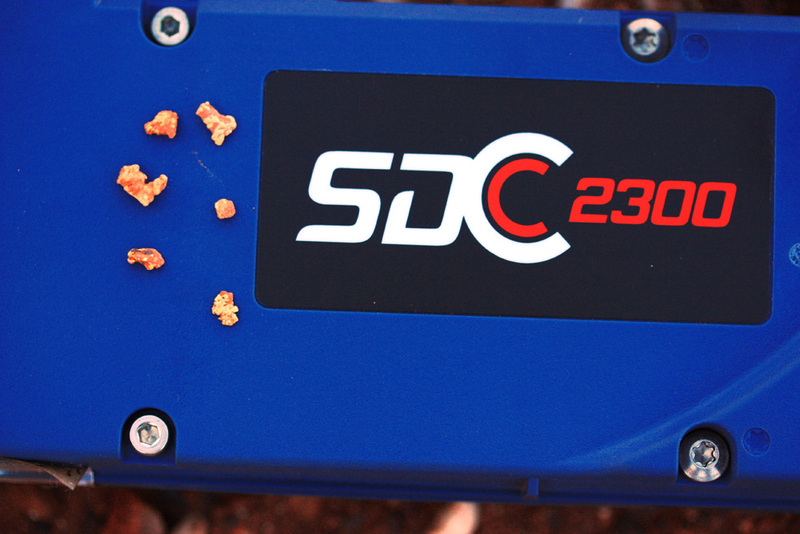 With much anticipation, the Minelab GPX 5000 metal detectors were set up, and our gold prospecting holiday had begun. The first day proved fruitless for Jill, but Jack could boast of two small pieces weighing in total .7 gram. 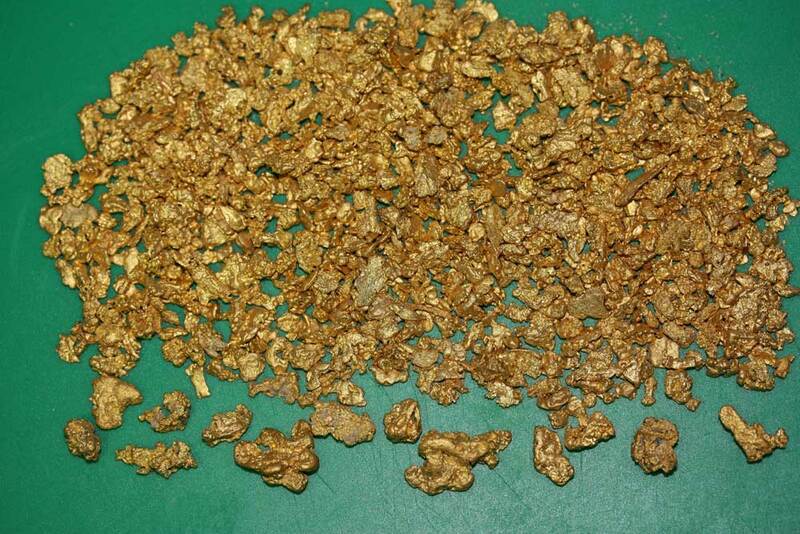 It was encouraging however, to meet up with a friend who had been swinging his metal detector in the area for a couple of weeks, and had been quite successful – yes, there is still gold to be found in WA. By the way, he mentioned that we were the first people he had spoken to for two weeks. We will keep you up to date, as the trip unfolds. Hopefully, the “big one” that we all dream about, will be part of the next instalment.